Cable is holding near the lowest point of near-term congestion which extends into fourth straight day on Friday, following triple rejection ad daily cloud top and Thursday's close in red. Thick falling weekly cloud also weighs, keeping near-term risk shifted lower. Daily momentum remains negative and studies are in bearish setup, adding to negative outlook. 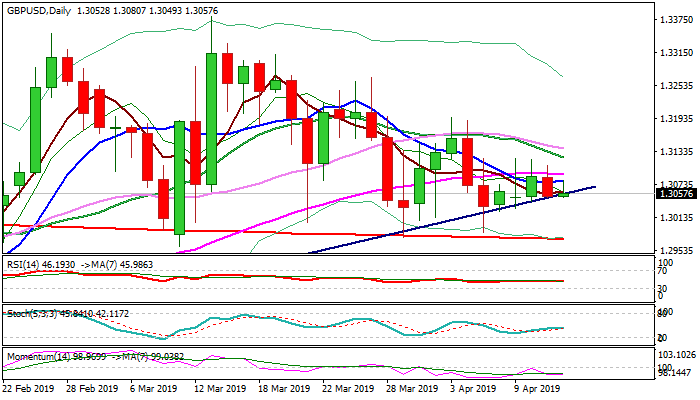 Fresh weakness probes below trendline support (1.3057) which kept the downside protected in past two weeks and firm break here would unmask key support provided by 200SMA (1.2978). A cluster of barriers between 1.3080 and 1.3130 keep the upside limited and only break above would neutralize downside risk.